Stayed here in June , we are a family of 5 ages 11, 8 and 6. The location of the hotel is situated in a remote area. There's not really anywhere to go for a walk after dinner as some people like to do with the exception of a small supermarket and a local bar a few hundred yards to the right. The waterpark attached to the hotel can be accessed through a gate which opens about 11 next to the wave pool, you can walk straight in without going through the main entrance. We found this ideal as you don't have to rush in early as you can just wander in or out for the odd hour or so every other day. The park is great with some exciting slides with plenty of space and beds. This alone is value for money included in the price of your holiday. The wave pool in the hotel is excellent and many a happy hour can be had here for a change of scenery from the main pool. I read some posts saying the food was not up to scratch but there was something for all tastes from breakfast with omelettes, scrambled eggs, sausages , bacon, breads, fruit, tea, coffee and juices. Lunch was also good with lots of beef, pork, chicken and fish dishes. Dinner also had many choices with all of the above including pasta, chips, salads, vegetables and soup and these were all followed with cakes and ice cream. The restaurant above the wave pool also done theme nights like Italian, Asian and Greek but we found this a lot hotter than the main restaurant at night. The hotel staff were all very friendly welcoming and polite. The Entertainment team were excellent and were very friendly and hard working keeping everyone busy throughout the day and even did every night show as well. They did try their best but I feel the hotel could have maybe brought in some outside acts to change things a little. At night some people found there was not a lot to do, you could either watch what ever show was on or go to the main bar and entertain yourselves by playing cards as a lot of people did. The majority of the guests seemed to be Dutch with a mix of Danish, French and British. I thought after going here it was time to update the review on this hotel. So if you like a holiday that is based around the hotel pool and having some family time,the odd show at night and not drinking into the early hours this hotel is for you. Had a great time and I would go back again. My children chose this holiday last year, after their dad passed away. A great hotel, towels changed every day, even the cleaners waiting outside to give you clean towels. The bar staff were a laugh, if you talked to them and used manners some foreigners just asking for a drink with no please and thank you, got to the point I didn't need to ask for a drink they knew what I was drinking. Guets could help yourself to soft drinks, coffee, water etc. Free Bus to Corfu town and the beach. You can order a packed lunch to take with you the night before from reception. Water park was fab, just needed to go and get your wristband in the morning. 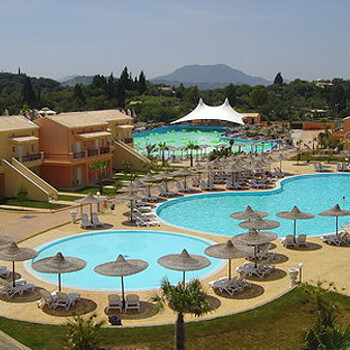 me and my family (mum 62,dad 62, me 28 & daughter 3) stayed at the aqualand resort corfu in june 2010 all inclusive. the hotel was great. the room we had was a double bed and a double sofa bed devided by a 3/4 partitioned wall. we had a kitchenette (with no kitchen utensils) which had a fridge freezer, microwave and a cooker, there was a large shower with a seperate toilet. we were on the ground floor which had a nice little patio area with a table and chairs out the back. the only thing that we found a problem with the room was where to hang our wet washing. there was no airer provided and we had no railings on our patio to hang stuff on. we made do with tieing our luggage straps together and hanging it between 2 chairs. its not so bad if you are upstairs because you can hang your washing on the balcony but i would suggest you take your own washing line. the pools were great. there was a large kids pool and a good sized adults pool with a lifeguard from 10-6pm. the wave pool had the waves in operatition with a lifeguard between 11-5, and they provide lots of rubber rings to use. the aqualand was open from 10-6pm and there is a gate near the wave pool that is open from 11-5pm. you can go in and out of the aqua park all day but you must go through the front entrance first time to get your coloured band for that day. all the pool areas were clean and tidy and there was always plenty of sunbeds to use. the food was ok but got repetative. the breakfast was always the same. sausage ,egg (all varieties), beans, mushrooms, potato slices, pancakes, fruit, cake, cereal, toast ect. i thought their bread was horibble, it was very dry and if it was toasted it was hard as brick. we stuck to the cut yourself bread and rolls as these were softer. tea, coffee, juice, milk and soft drinks are all available. lunch and dinner was a choice of salad, meat in sauce, a fish dish, potatoes & pasta. spaghetti with either 1 or 2 choices of sauce, chips, a choice of deserts & icecream were available at every meal as was beer and wine(lunch & dinner). the chips were allways sprinkled with herbs which my daughter refused to eat because they had green bits on them lol. 10am-12.30pm they had hot snacks by the pool bar. this included chips, sausages, fish fingers, nuggets, little pastries & cheese and ham toasties. in the afternoon they had toasties and cake available 4pm onwards. if you get fed up of the food in the main restaurant they have a theme restaurant which overlooks the wave pool. they had bbq, greek, italian and asian nights. you have to pre-book this at reception the day before by 5pm but the limit is 80 people so book it in the morning. the drinks were all inclusive until 11pm. the pool bar was open 10am-6pm and the lounge bar was open from 5.30pm. you help yourself to soft drinks, juice and water which was good as no queing. the cinema bar opened from 8pm and sold popcorn too at 2.5Euros' a bag. the entertainment was run by a bulgarian team and they were great, ruby, nico, mimi and all the others made our holiday even more special as they were so friendly and welcoming. they played volleyball, football, basketball, french bowles, morning gym and a cocktail game in the mornings. from 3pm they play waterpolo, table tennis, darts and aqua aerobics. they try and get you to take part but dont force you which is good. the best bit was when they come round doing 'housekeeping' and 'massage' it was great fun watching that and be prepared to get wet :). they also do activities for kids. face painting, hat making, football, water polo, t-shirt painting and play games. there was a kids club but only for the dutch kids and run by a seperate company. in the evenings you were mainly restricted to the hotel. the team put on a mini disco at 8.45 and a show or quiz at 9.45 and they would sometimes play bingo too. the hotel provided a bus to the beach and a bus to corfu town twice a day. which we never used so cant comment on them. there was a small supermarket onsite. if you want to buy any cigarettes you have to order them in advance. We went en mass (me, husband, son + 2 grand daughters 11 & 13 + grandson 18 mths) I would thoroughly recommend this resort, the staff are all hard working and very friendly, if I had any query it was dealt with quickly and efficiently (I asked for a kettle as our appt did not have one). The rooms were clean and comfortable and all in very close proximity to the resort pools and the wave pool. Granted, the food was a bit repetitive, but all very tasty, and a good selection. The kids enjoyed the freedom they had, as they didn't have to be joined to the adults all of the time. The entertainment team worked hard through the day to get everyone to participate in events without being pushy. They then went on to entertain the kids early evening then adults up to about 11pm. Overall a great holiday, am planning to go again next year. we have just come back from this hotel, and we had a fab time. The room was great, large lounge area, twin room, then up the stairs we had 2 bedrooms, large patio dooros from lounge and bedroom onto large balcony. Small kitchen area with kettle and fridge. The food was nice if a bit samey by the end of the 2nd week, but always something that we all liked and plenty of it. The hotel was spotless at all times, as was the room. The staff were friendly and pleasant. The waterpark was fantastic, we went in every day for at least an hour, the kids went in for longer, the wave pool was huge and great fun too. We caught the free bus to the beach which was great and also to Corfu Town and so that saved a few euros. The entertainment was a bit ropey to be honest it did get better but wasn't brilliant, but after a few vodkas (at least triple measures) it got better.!!!! All in all a great holiday and if anyway asked for our opinion on whether to go I would say definately yes, especially if you have kids they will have a fab time. After reading a few different reviews we were not sure what to expect when we arrived at the hotel, but I am pleased to say that the hotel, which is a 20 minute transfer from the airport, was very clean and the reception staff were friendly and efficient on check in. In fact the receptionist was checking in 5 families at the same time, serving each family with a smile and friendly chat. We were a group of 7 and as we were 2 families we were allocated our rooms. My sister, her husband and daughter were in a studio room, on the ground floor, with a double bed, single bed, fridge and seperate bathroom, which to be honest is what we were expecting having gone all inclusive before. My 2 children, husband and myself were staying in a one bedroom apartment, above my sisters, and we couldn't believe our room! We had a kitchen area, (admittedly the kitchen utensils were removed, but there was a working microwave, cooker and fridge/freezer), bathroom, the master bedroom, lounge/dining room on the ground floor with stairs leading to a mezzanine with a single bed and a door leading to another bedroom also with a single bed! It meant that my children aged 14 and 12 had their own rooms. We had a patio door leading out on to the balcony from the living room and also the main bedroom and the balcony was quite large really. The rooms were cleaned daily with linen changed every other day. We arrived at the hotel quite late and the restaurant shuts at 9.30pm for dinner, however the staff were very friendly and allowed us to come in and have some food even thought it was 9.45pm. We found the food to be really good. Every evening there was a chicken, fish, beef/lamb, pork, pasta, chips and vegetarian option. There was always salad bar, soup and puddings! And as a previous reviewer mentioned there was always spaghetti bolognaise. My children are not fussy eaters and so there was plenty for them to choose from. However for the younger children, if they like pizza, chicken nuggets, fish fingers, then unfortunately this wasn't catered for. However as I said I thought the food was varied and of a really good standard. And it was continually replenished throughout the restaurant opening times. My only critism is that there was not alot of Greek food on the menu, apart from Greek salad, humus and Mousaka once. We chose this hotel as the waterpark was attached to it and we had free access to the park every day. And we really took advantage of this and have the photos to prove it!!! Not sure who enjoyed the slide the most, the children or the bigger children!! Every day you had to go to the park entrance to get a new wristband, and after that you could wander from hotel to park at your leisure. It was brilliant and not at all busy, it was almost like having a water park to yourself, we didnt have to queue on anything. Mind you it had only been open for a week this year but still it was very quiet. If you had to pay to go in it would cost 25 euros per adult and 17 euros per child but as a hotel guest we got it for free! The entertainment team, who were very friendly, tried their best but unfortunatley weren't great, but there is a mini disco every night and it seemed like bingo on quite a few nights also. On their night off a 'professional' singer performed, which you would think would make a change - however he was from the Netherlands and sang all his songs in Dutch - so couldn't understand a word he was singing! As most of the guests were British after about 10 minutes he was only singing to a handful of guests as everyone else was in the downstairs bar, which was very busy for a change!! There are loads of sunbeds around the swimming pools and also the wave pool (which was brilliant! ), however we did find that sometimes trying to get by the wave pool was a bit difficult as the beds had been reserved by the water park guests, even though there were hundreds of beds in the park. I must say though that if I had paid 25 euros per person for a day in the water park, the last thing I would be doing is sunbathing!! We had booked this holiday in October 2006 . It was to be a surprise 16th Birthday treat for our daughter. We arrived at the hotel to be told by the incredibly rude reception staff that they had overbooked the hotel and we did not have a room. They told us we would have to transfer to Kavos in the south of the island. I explained (or tried to explain to the receptioinist in between her walking off , talking to other customers returning to me and staring at me!) that we had booked this for a birthday treat, but to be honest she really was not interested. Instead she continued to issue other guests with their rooms. I asked her why we could not have a room as we had arrived before the other guests , she told us "You just can't". I asked to speak to the manager but was told he wouldn't arrive until 7pm, it was lunch time when we arrived. I spoke with Med hotels who instructed her to give us a room but they would not. Eventually she offered me to speak with the manager 1/2hour after she told us he wasn't there! We spoke with the manager and was told "It was just one of those things" we again explained the situation to him about the water park being the reason we had booked so he offered a place at Sidari village because it had a waterpark, he said we would get free entrance in it and it was in easy walking distance! WHAT A JOKE - The "waterpark was a pool with 2 slides and was free to enter anyway. We had to hire a car to drive to the waterpark at aqualand because they would not pay for a taxi or put on a coach. We are not the only family this happened to, another family slept in the foyer and waited 14 hours until the manager gave them a room. If anyone is going to this hotel be prepared for complete rudeness and lies . Book some where else if you haven't already booked.